What a wonderful meme! The best sentence read this past week... reminds me of Hemingway's "one true sentence" idea. And your pick is most intriguing. I see Hosseini's book everywhere now, your sentence only makes me more curious. Thanks for posting this, and now I must go over the The Quivering Pen to find out more. Arti - I love the idea behind this meme, too, and enjoy alternating it with The Sunday Salon. I have that line marked too! I was *this* close to buying this one this morning since I had a coupon and you are loving it so much. But since I just downloaded two books & have sooo many review books to get through, I had to pass. Now I'm pouting! Lisa - Oh, I know... thankfully I'm caught up on review books and have managed to avoid NetGalley, too. great sentence - I expect nothing less from this author. 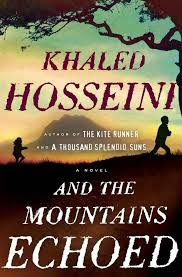 Booksnyc - Hosseini has delivered another winner! Bellezza - His novels can be emotional roller coasters, but he is a gifted storyteller. I want to read this as well -- waiting for my turn from the library. Brona - The reading experience was great at home.. can't imagine how wonderful it must have been in Bali!